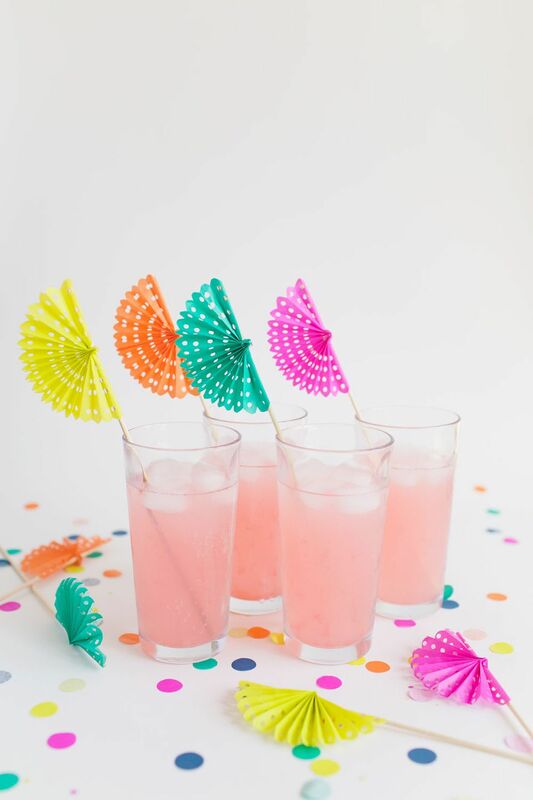 Enhance the drinks you will be serving at your Cinco De Mayo party by making mini paper fans drink stirrers that you can stick in each drink. These cute fans are quick to make out of small pieces of tissue paper that are folded and hole-punched to make a beautiful design that can be attached to wood skewers. Set the table for your Cinco De Mayo or taco Tuesday dinner party by making mini pinatas that you can leave beside everyone's dinner plate as a fun activity before the meal. These cute pinatas can be made with cardboard and tissue paper, and unlike traditional pinatas, the mini pinatas are easy to get the prizes inside out without making a mess as there is a bottom flap to open to pour out the prizes inside. Make sure everyone is dressed up for your fiesta by making mini sombrero headbands for everyone to wear. You can quickly make a bunch of these fun headbands in minutes by gluing the hats to a fabric headband and using a bit of thread to further secure the hat and headband together. As an added bonus the mini sombreros are a much cheaper alternative than regular sized ones and can easily be worn by children or adults. Have fun at your fiesta with a huge taco pinata that you can make in an afternoon out of cardboard and yellow, green, brown and white crepe paper. The breaking of pinatas are is traditional in Mexico with almost every festival where the pinata is suspended above and blindfolded people try to hit it with a stick to access the candies and prizes inside, and your guests are certain to enjoy having their own turn to be blindfolded and attempt to strike your giant taco pinata. At your Cinco De Mayo celebration offer everyone some delicious decadent cupcakes decorated with handmade cactus cupcake toppers that say "let's fiesta". You can easily make these toppers minutes before the party starts by printing out the cupcake topper template and attaching the design to toothpicks which can then be stuck in your homemade or store bought cupcakes. Get ready for your fiesta by adding a bunch of bright paper flowers that you can make out of several sheets of tissue paper that are gathered together to create large flowers that can be hung on your wall or around a door frame with tape. For this Cinco De Mayo make some individual cupcake stands out of green paper that make a cupcake look like a cactus. To assemble your own stands you will need to print the template on green paper and follow the simple assembly instructions to make this fun way to enhance your cupcakes at your fiesta. Normally cacti and balloons do not mix will together but you can create cactus balloons by attaching two smaller balloons on a regular sized one and drawing on the needle details with a marker for a clever way to inexpensively decorate this Cinco De Mayo. Add some pinata-inspired balloons to your party with this quick DIY, by using regular scissors or fringe scissors cut long strips of tissue paper with a decorative fringe on one side to wrap around inflated balloons for a creative way to decorate this Cinco De Mayo that only costs a few dollars to make. After the party is over hand out a pinata fringe balloon tied to a string to each child to take home with them as a party favor they are sure to adore. An inexpensive way to decorate for your next fiesta is by making a homemade banner using a printable template. To make the banner all you need to do is print the template and cut out all the letter flags in the banner which can be hung from a string tied or taped onto a wall. Use up some of that washi tape you have been collecting, by adding some temporary large wall art to your home my making an outline of a cactus using green washi tape on your walls as a great way to set the theme for your next fiesta. To make a bold accent wall for your party, try making several cacti outlines using various colors of washi tape, and having each cactus being a different shape and size to add visual interest. Continue your Cinco De Mayo party theme to the appetizers you are serving my crafting your own fiesta-inspired food toppers by printing a template of circle or flag designs that can be cut out and glued onto short wooden sticks such as toothpicks and stuck into your party snacks. The food toppers include pictures of sombreros, limes, maracas, along with Spanish words such as hola, fiesta and amigos. Toss a handmade cactus stamped pillow on your sofa to give a bit of Mexican flair to your living room. To make your own cactus pillow you will need to make your own cactus stamp by carving the design on a piece of foam and gluing the back of the foam to a small piece of wood. The completed stamp can then be used on a plain white pillowcase using a black ink pad designed for fabric to make your pattern. For a sweet ending to your fiesta surprise everyone with your homemade cake topped with a DIY cacti cake topper that features three different types of cactus plants that are made of foam sheets cut and painted to look like neon plants. For a quick backyard garland for your party, you can use short pieces of brightly colored yarn tied to a long piece of string for an original garland that looks beautiful when it sways from a light breeze. Add some large colorful party decor to your fiesta by making some multi-colored lanterns e using embroidery hoops and cut sheets of tissue paper. Get dressed up for your party by making your own Frida Kahlo inspired floral headband to wear by covering the top of a headband with silk flowers. Add some fun to your table setting for your fiesta by dipping the handles of boring white plastic cutlery into acrylic paint to add some bright hues to your temporary party flatware. Transform a regular store bought pinata into something glamorous with a fresh coat of gold spray paint and some decorative tissue paper flower accents. Beautifully package up bags of homemade treats to send home with guests for your Cinco De Mayo fiesta with this super easy DIY. All you need to do is download the free template from Camille Styles and print it on vellum bags which can later be filled with a delicious treat. Instead one large pinata group together several small cactus pinatas made out of toilet paper rolls and green crepe paper to decorate your home for Cinco De Mayo. Label all your Cinco De Mayo food essentials such as guacamole, pico de gallo or spicy chocolate cupcakes with these 12 colorful printable signs that you can cut out and fold in half in minutes. Add papel picado banner to the cocktails you will be serving this Cinco De Mayo by making straw flags out of tissue paper cut with a paper cutter punch to easily create an intricate pattern on a small piece of tissue paper that can be attached around a straw. Download a copy of these 4 printable Cinco De Mayo favor boxes that you can print onto cardstock and assemble to create easy party favor boxes. End your party with a bang with this clever DIY made out of toilet paper rolls and tissue paper. Affordable to make, this handmade garland is an easy way add color to your fiesta, and to end your party in a memorable way, invite each guest to pull on one of the pinatas to let candy or prizes inside the individual size pinatas pour down into their hands.